I’ve been pulling some stats together and thought you might be interested in the result. It’s a bit of a 2016 stats “teaser” to give you something to think about as I plug away on the long overdue monthly stats posts. Anyone who has followed my posts at VancouverPeak.com knows I strongly disagree with the Great Oracle (REBGV) bundling ‘$1mill+’ property sales with the rest of the SC's single detached home sales. This post clearly shows you why. I’ve been tracking the SC real estate market for close to four years now and have developed my own system for tracking sales that while not perfect is awfully darn close. What I know is that The Board bundles single detached homes, MOPs (Manufactured on Pad), and ‘$1mill+’ properties in its detached sales figures (sales, median sales price). 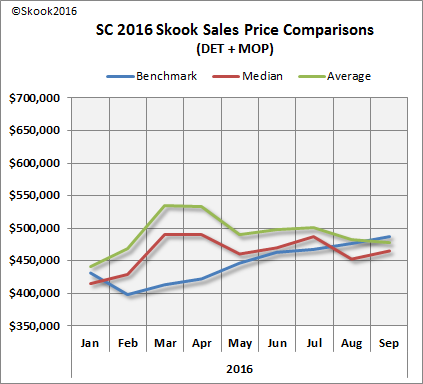 SC Realtor® Gary Little bundles single detached sales and ‘$1mill+’ properties and omits the MOPs in his detached sales figure and median sales price. He counts the MOPs separately. Last year, I decided to calculate my own median sales price by bundling single detached and MOPs and removing the ‘$1mill+’ properties. The effect versus Little’s DET median sales price was a drop of close to $20,000 each month. However, the greatest impact is on the Average Sales Price. The Board doesn’t offer the Average Sales Price in its monthly stats package but it is presented in its chart packages (check it out here - scroll to bottom). Little used to give the Average Sale Price each month but switched over to the Median Sales Price in 2014. 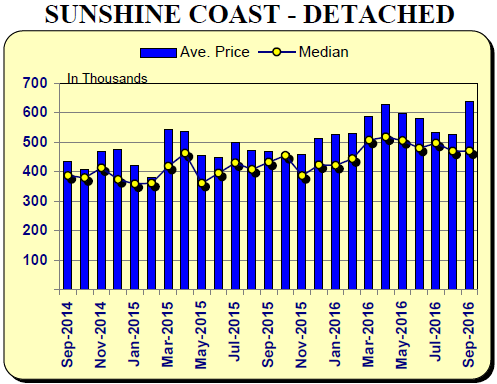 The chart below shows the detached sales for The Board, Little and I depending on how we bundle our detached sales. These are the totals I use to calculate Average and Median sale prices. So each month, the Board reports the Benchmark and Median Sale prices and Little reports his Median Sales Price and I’ve calculated the 2016 Average Sale Prices for both using my tracking method. The charts below show The Board and Little almost identical; however, on closer inspection Little’s Average and Median Prices are higher due to the missing MOP sales. Feast your eyes on that Average Sale Prices line - that’s one impressive great leap upwards in September, isn’t it? The Board’s spike starts from about $530,000 in August and soars to roughly $640,000 in September. That’s the influence of 7 sales valued from just over $1.1 million up to $3.3 million. Now, here is what happens when you remove all the ‘$1mill+’ property sales. Whoa, that really deflates the Average Sales Price, doesn’t it? We see that it peaked in March at around $540,000 and then fell, and then there was the tiniest rise in June and July and then slipped again to around $475,000. (Note: the Foreign Buyers Tax is not applied to SC property sales). My Median Sale Price also follows a slightly lower path, but the Benchmark remains the same since no one but the Great Oracle has the key to unlocking its secret formula. As mentioned in a previous post, we wait to see how the Federal Government’s October 3rd rule changes will impact all markets within the REBGV, throughout the province and across Canada. 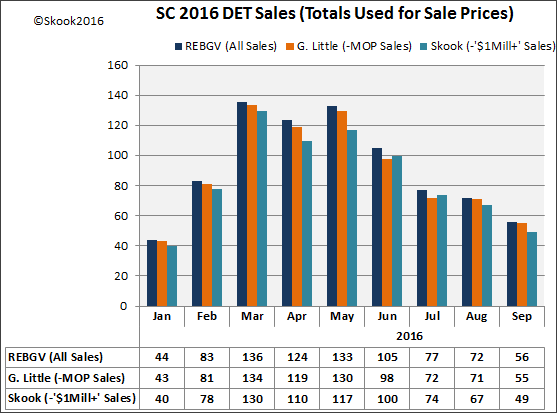 Here’s the REBGV’s SC Chart showing Average and Median sale prices just to confirm I’m too legit to quit.